Themes provide users with the ability to customize the look and feel of their portfolios when they are shared via Secure URL outside of Chalk & Wire. Themes assist in conveying different tones, depending on the intended audience and/or purpose (course/program, professional, personal, etc.) Each portfolio can use a different them. Administrators can create personal themes as well as public themes. 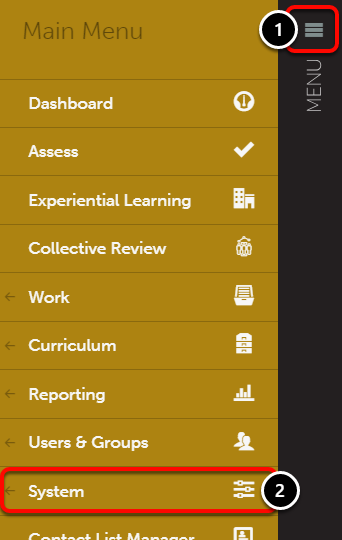 Public themes are available to all users in your institution's Chalk & Wire site. Wondering how to apply a theme to your portfolio? Instructions can be found here. 4. 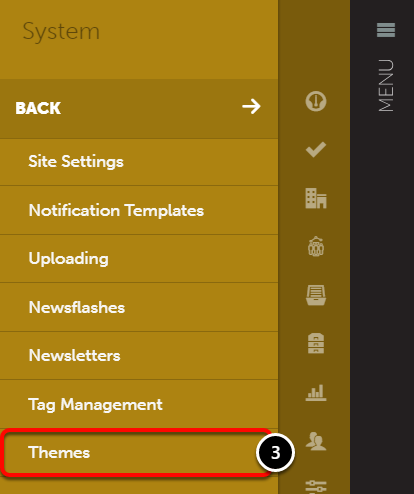 On the Themes page, click on the Build New Theme button. A preview for the default colors and selections will appear on the left hand side of the screen. 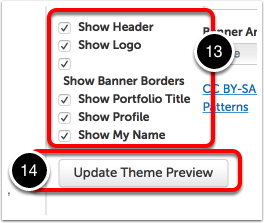 As you work and update your custom theme, this preview will change based on your selections. 5. Enter a Theme Name. 6. 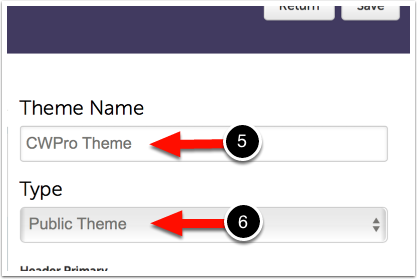 Select whether or not you would like to create a Personal Theme or a Public Theme. 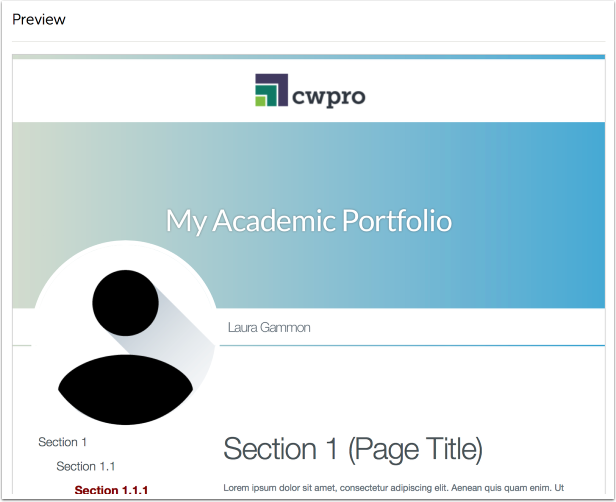 A public theme will be available to all users for use in their portfolios. 7. Click on the different colors to select new colors for each of the various options. 8. Once you have clicked on a color, a Color Picker will appear. Use the Crosshairs to select the main color, and the Slider to select the brightness of the color. Not sure what the different options mean? 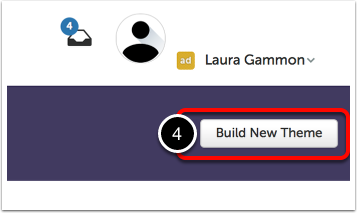 Change the color or selection and use the Update Theme Preview button at the bottom of the Theme Builder screen to update the preview. You can update the preview as many times as you'd like to ensure that your custom theme looks the way you'd like it to! 9. Select the Banner Height. The Banner Height dictates how tall the image at the top of the portfolio appears. 10. 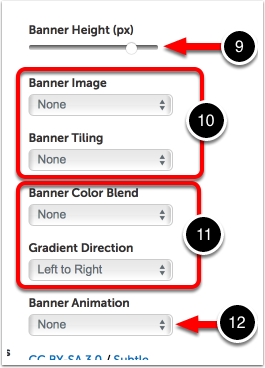 Select a Banner Image and Banner Tiling. The Banner Image drop-down menu is populated by various pre-loaded images, as well as any images that exist in your File Library. The Tiling option dictates how the image repeats within the banner. 11. 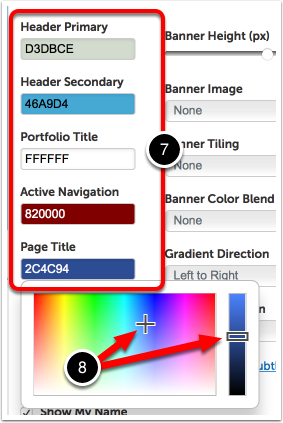 Select the Banner Color Blend and Gradient Direction options. These options will change the way that the selected banner colors appear. 12. Select a Banner Animation. Animations are pre-loaded moving graphics that will be applied on top of the banner colors or image. If you have selected banner colors and a banner image, the image (and its tiling options) will override the colors. 13. Make selections for what you would like visible in your theme. 14. Click on the Update Theme Preview button to update the preview. Adding a Profile Pictures are not added to the theme itself, but rather to your account. Information and instructions can be found here. If you are creating a public theme, the profile picture applied to the theme will be that of the user(s) employing the theme, not your own. 15. Once you are satisfied with your custom theme, click Save.